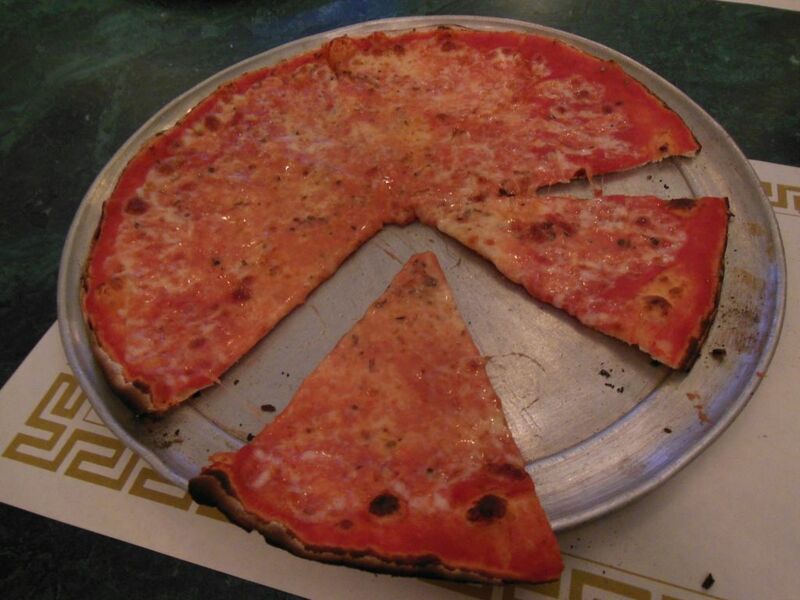 Bayonne, NJ’s Big Apple—Watch Some Sports and Eat Some Great Pizza! These days, when the Snob goes back home to Bayonne, he fills in his trips to the famous pizza joints in Manhattan and Brooklyn with visits to places in his old home town. There is no shortage of pizzerias and bars making pies in Bayonne. Having already covered a lot of ground, I am now down to those that weren’t around or that I didn’t frequent when I lived there. 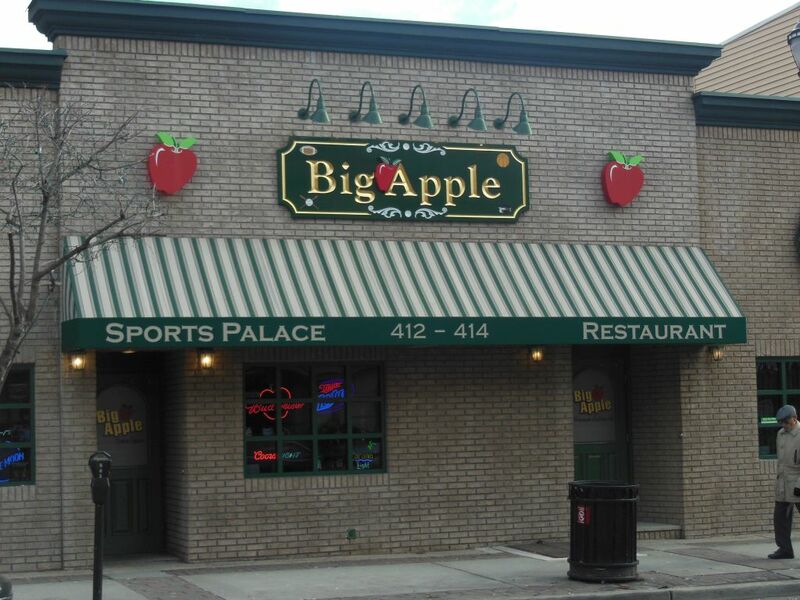 The Big Apple Sports Palace & Restaurant sprung up on Broadway in the late 70s. While it’s got the feel of a neighborhood bar, the Big Apple is a sports and evening hot spot that attracts a crowd from all over town. Similar in many ways to the Venice, it has a split-identity with separate entrances: left into the barroom (Sports Palace) or right into the dining room (Restaurant and Catering). Each room has several large screen televisions, and late one NFL Sunday afternoon, I found both filled with lively sports fans. 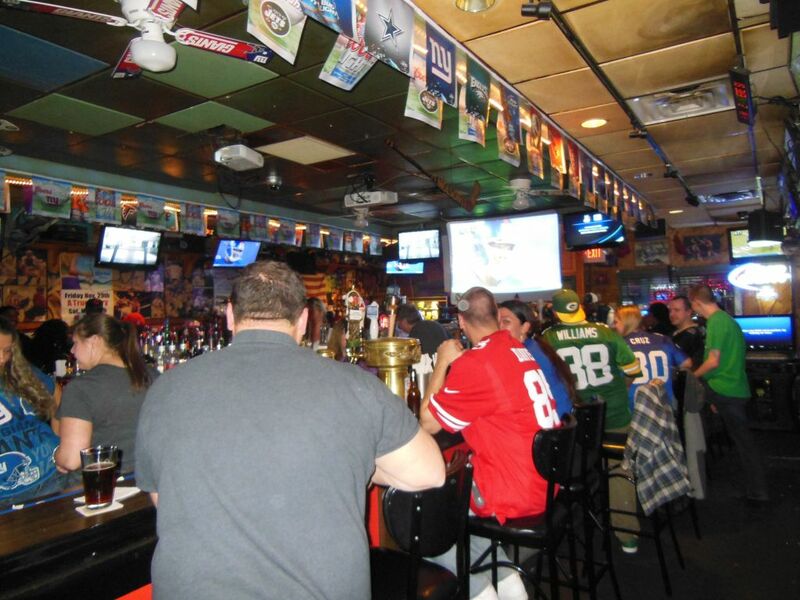 With the Giants-Packers game in full swing, finding a spot in the bar was out of the question. 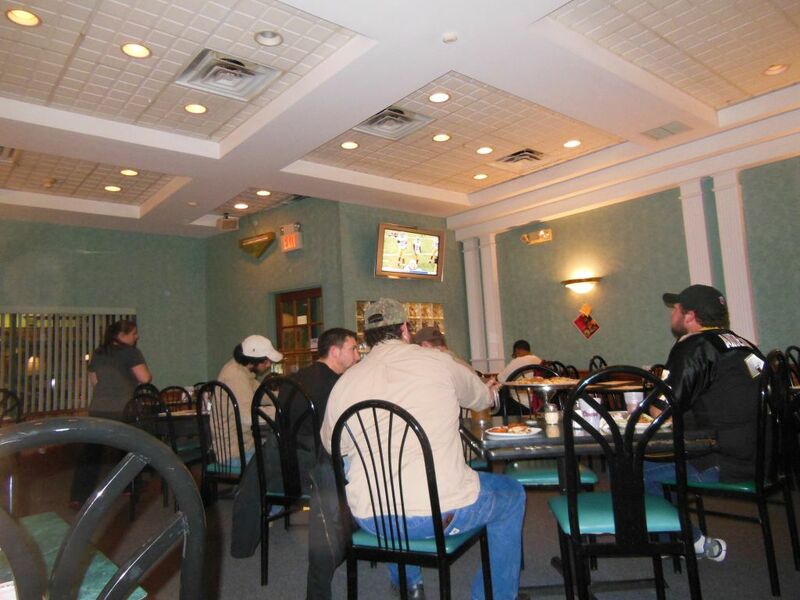 So, I grabbed an empty table in the spacious, half-full dining room where a small group of serious Saints fans were watching their team play. While, Big Apple carries a full menu of Italian dishes, it boasts about pizza and Buffalo wings. I knew what I was looking for—a famous Bayonne “bar-pie” meant just for me! I requested a plain cheese bar pie ($6.50) and watched the Giants while I waited. Big Apple’s outdoor sign advertised “Famous Thin Pies.” In looking around the room, however, I noticed some thicker ones. It seems, the waitress told me, that some have to be made thicker to support the toppings. Another reason a true pizza snob is a cheese-only guy! I saw on the menu that their choice of toppings even included Kielbasa—now that’s an “only-in-Bayonne” thing for sure! My bar pie showed up fairly quick and turned out to be a ten-incher cut into eight small slices. And, yes, it sure was ultra-thin, similar to the Venice’s, but slightly firmer. Each tiny slice was easy to fold and fit right into my mouth: two bites, the crust and I was done. Overall it was delicious with a light, tasty, oregano seasoning. The crust was cooked well with a blackened thin end crust and a charred toasty bottom. It perhaps could have been little crispier for my liking. One minor flaw was that the tomato sauce ran a little thin and watery in its mix with the olive oil. Nonetheless, it was still quite flavorful, and I knocked off all eight slices in no time flat. It was wonderful! The service I received was warm and friendly and furthered my enjoyable experience at the Big Apple. In addition to finding their pizza to be quite satisfying, the Giants even held on to beat the Packers making it a great day all around. Next time you get a craving for great pizza while watching the big game, leave the living room and head over to the Big Apple—you won’t be disappointed. When r u going to Mamarosas Cucina on 36 the .st. & Broadway. I worked and ate there for six years. Great pizza ! I went there just two weeks ago when I was back home. I will be reviewing it soon! I happened onto your website and have enjoyed reading your reviews. My husband with a few partners just opened a place in Ft Worth and I thought you might get a kick out of visiting the website. It’s at Pizzasnob.com. Maybe we will see you in the store when you get the chance. Have a great day! I heard about your place and am looking forward to a visit next time we go back to Texas. Great name and good luck with the new venture. ← Times Square’s Famous Original Ray’s Pizza—Location, Location, Location!